"I have two smoke grenades. I can make it. I think I can make it. Alright, those guards have machine guns, I probably can't make it. I'll try it anyway." This type of illogical step into chaos completes a wonderfully satisfying loop in Monaco, the recently released top-down heist game. It combines minute planning and stealth with frantic efforts to manage failure. Of course these sensations are common in stealth games. When spotted, a hurried attempt to escape and duck into the shadows can be a rewarding experience, or painfully frustrating depending on the player or the game. Monaco does something else interesting however, it rewards planned failure. For the most part, I hate planning for the worst-case scenario in games. Buying an item in an RPG for a potential disaster, while smart, always felt backwards to me. If I plan to win, then ideally I will never put myself in worst-case scenarios at all. My execution should be perfect, settling for something less than perfect still feels like failure. But then I find two guards between myself and a locked safe. Instead of planning an elaborate plot to lure away one of the guards and flank the other, I start planning for failure. I can dash in, throw a smoke grenade, open the safe, run up through the alarm system, climb the catwalk into the vault, make another mad grab for money while the guards are distracted. It's always been my personal dream to give chase to armed guards while carrying loads of cash. 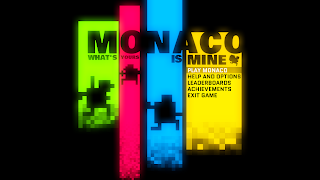 I want to praise Monaco's incredibly compelling loop of planning and failure specifically because so few games can manage the transition so smoothly. For the most part, stealth games transition players from stealth, to chaos, to a reset. Getting away might be fun, but the end goal is another attempt at the same objective with the same context. It is far more rare for a moment of failure to be turned into a dramatic opportunity for success. More than any other aspect of Monaco, its ability to blur the lines between a chaos and planning captures the thrilling hijinks of the best heist films. Now when another player joins the caper, the ability to plan and adapt to failure is even more electrifying. If I have a partner to revive me or benefit from my mistakes, I completely abandon my normal behavior and blindly, madly, and with a grin, kick the hornets nest and revel in chaos and failure.